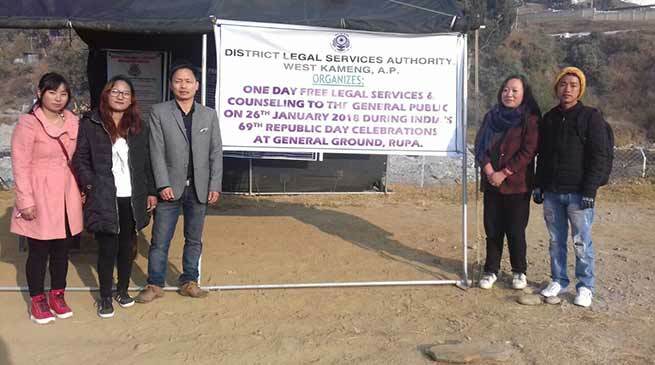 West Kameng District legal services Authority (WKDLSA) organised one day free legal services and counselling to the general public on the topic of lok Adalat, Arunachal Pradesh victim compensation act 2011, RTE act 2009, person eligible to receive free legal service etc on Friday. The camp was organised to commemorate 69th Republic Day at Singchung and Rupa under West Kameng District. Advocate Atum Lamnio and Advocate Lobsang Droima represented as resource person along with PLVs at Rupa. Advocate Khamu Desisaw, Advocate Rinchin Khandu and Advocate Phurpa Tsering represented as resource person along with PLVs at Singchung while large numbers of local participated in the camp and discussed various right and privilege available in law and other individuals issue for their solution.